October 31, 2017 marks 500 years in which Martin Luther nailed his 95 problems or theses to the Castle Church door in Wittenberg, Germany. 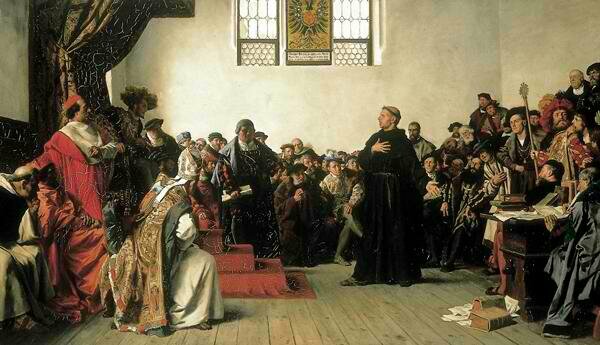 Because of the actions of Luther, Protestant churches are ubiquitous. Who was Luther? What was going on in his head? What motivated him? Although Luther is typically thought of as being an Enneagram 1, I believe that Luther could have been an Enneagram 6w5 counter-phobic primarily due to his relationship with his wealthy father and the fact that he married a nun. If this assessmemt is correct, this means that Luther was a passionate pessimistic problem-solver who sought safety. Under fire, he would project, become partisan, and protect others. Luther sought protection: In 1505 a terrible thunderstorm besieged then law student Martin Luther. He felt his life was in danger–typical of Enneagram 6. He cried out to St. Anne and bargained that if she saved him, he would leave law school and join a religious order. He was saved and he joined a religious order. Enneagram 6w5 goes to fear under stress. They seek safety. Luther set up systems to provide security: Luther was very diligent in his study and worship—arguably more than most people at the time. He poured himself into it. The Enneagram 6 means he is driven by emotion. The w5 means he is fiercely intellectual. In 1506, he gained admission to the Order. In 1507, he was ordained. In 1508, he was teaching theology. Enneagram 6w5’s seek to create systems to provide security. Systems provide structure. Structure feels like comforting walls or shields. The secure walls of the cogent systems also provided the emotional component that emboldened Luther and made him passionate. Problem solving provides security to the Enneagram 6. Enneagram 6’s are motivated by security. Luther sought to fix perceived errors in the Catholic system: As an Enneagram 6w5, Luther can spot problems within systems. Luther sought cohesiveness in Catholic theology but found 95 problems in the Catholic church system that troubled him. He wanted to fix the system. So, he had to tell the church. There is nothing wrong with that, right? In 1510, Luther made his first and only trip to Rome. Rome is where the Pope resides. The pilgrimage was probably supposed to be the pinnacle of Luther’s life. On his knees, Luther crawled up the steps of the St. John Lataran Basillica passionately asking for forgiveness citing the Lord’s prayer on each step. All-the-while, in his mind, he was wrestling about whether his justification before God was due to his faith or his good works. Luther sought certainty. After much study of the Scriptures, Luther concluded that we are justified before God by faith. There is no need for struggling up the stairs to gain salvation. He was excited to spread the news. He was fixing the system. However, as Luther would learn, there were problems in paradise. As an Enneagram 6, he paid attention to personalities and motives too. During his stay in Rome, Luther became disturbed by the financial corruption he saw from some priests. He noticed one priest could perform six services faster than he could just one of his. More services meant more money. This bothered Luther. Luther poured his entire being into his passion. He was perturbed to see sheer pragmatism. Luther also encountered bad doctrine and fleecing the flock. Johann Tetzel was raising money to build St. Peter’s Basilica in Rome. He stated that repentance was not needed. Jesus, Mary, and the Saints had left enough grace for all according to Tetzel. By giving money to the church, one could pay their loved one’s way out of Purgatory. In his marketing jingle, Tetzel said, “As the coin in the coffer rings, so a soul from Purgatory springs!” The system had corruption. If Luther was an Enneagram 5, like Calvin, this would be a more of an intellectual exercise. But this was Luther, people were being hurt doctrinally and monetarily. As an Enneagram 6, he gained purpose by helping the down and out. He was a protector. Enneagram 6 is known as The Loyalist. As an Enneagram 6w5 counter-phobic is The Defender. This means he is going to move towards the thing that is causing pain. Counter phobic means that Luther is about to look like an Enneagram 8—the Dominator. Let’s get ready to rumble! System failure and the big break-up: Luther loved the Catholic church and wanted to see it restored. However, he met with resistance from the church. The more he received pushback from the church, the more he moved from protection mode to projection mode. The errors were so obvious to him. Why wouldn’t they fix the broken system? The system that provided him protection, now caused him duress. As the church ignored error, Luther became louder. He became partisan. When the church put him on trial, he sought to protect his position. He was certain he was correct. To him, they were not concerned with truth but maintaining the status quo. The trial went terrible for Luther. After the trial, he became pessimistic towards the church. He began to denounce the church. At his worst, he bordered on being paranoid. Betrayal and criticism push the Enneagram 6. Project, Deflect, Protect, Reform: As a protector, he sought to warn people about the Roman Catholic Church. He translated the Bible into the voice of the people—German. He created numerous pamphlets and distributed them to the people in protest to what the church had done. The movement he formed was called Protestant.